Australia’s Best Matched Betting Community! Every day, Australian bookmakers give away free cash in the form of bonus bets. 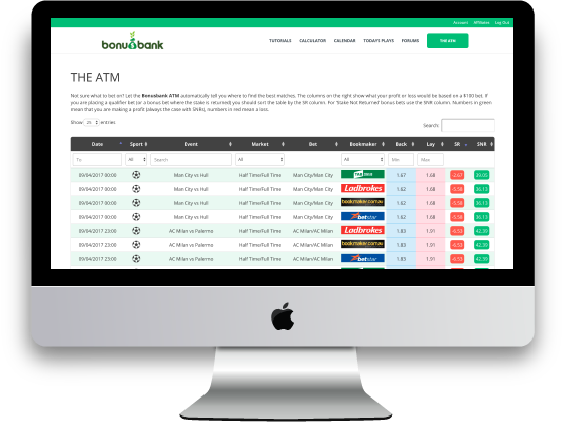 Here at bonusbank we use a risk-free technique called Matched Betting to turn those bonus bets into cash that you can withdraw straight to your bank account. Our Matched Betting tutorials, calculators, & software have helped hundreds of Australians to make thousands of dollars. If you’re looking for a risk-free way to make money online, there is no better option than Matched Betting! Since joining bonusbank I have more than tripled my initial investment. Matched betting is easy to learn and it requires only minimal time commitment. If you’re looking for a way to make some extra cash, this is the site for you. When I joined bonusbank I had limited betting experience, so I was quite cautious at first, but the bonusbank tutorials, forum and oddsmatcher software made it easy. Since then i have made an average of $1000 per month! I love sports, and have placed quite a few bets in the past, but never had much success as a gambler. Thanks to matched betting I get to enjoy the games knowing that I’ll profit no matter what happens. That’s a great feeling! Our tutorials will take you from a complete beginner to an advanced matched bettor in just a couple of months, making money every step of the way. 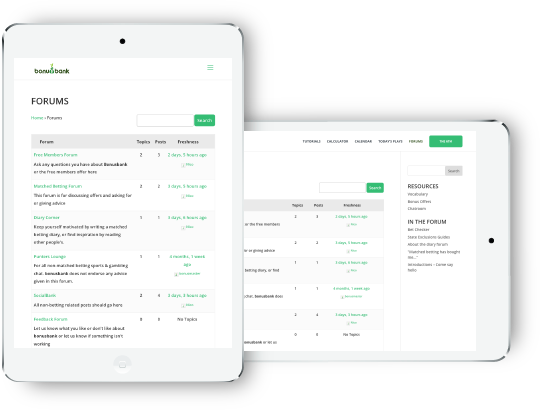 We make matched betting easy by putting everything you need in one place, including the best matched betting software in Australia and our selection of matched betting calculators. Our support staff have been matched betting since 2008, so they’re well prepared to answer any questions you might have. Not to mention the community of fellow matched bettors you’ll find in the forum and chatroom. The Bonusbank ATM is the best OddsMatcher software in Australia. It saves you hours by telling you where to find the best matched bets. When combined with our calculators it takes all the guess work out of matched betting. We also have Australia’s only dutching software, plus chrome extensions which can notify you of arbitrage opportunities, and help you profit from horse racing. Every day we search the web for the best Matched Betting opportunities and then deliver them to our members in our ‘Today’s Plays’ section. It takes members just 5 minutes a day to place these bets which average over $200 per week. You can see our full results from the plays here. When learning something new it’s always good to have people to share the experience with. Our forum is a great place to chat with other new matched bettors and to get advice from more experienced ones. We also have a busy chatroom where members share any matched betting opportunities that they find. I found out about matched betting from a UK podcast earlier this year and other than the odd punt on the Melbourne Cup I hadn’t really placed a bet before. The concept of matched betting intrigued me so much I spent quite a bit of time considering it and that was when I found bonusbank. From the initial contact, Nico and the team were super helpful and answered all my questions (and I had a lot of them) quickly and in depth which really helped me get my head around everything. The website is packed with information, a chat forum and incredibly useful software and they even advise you exactly what bets to place to make consistent profits. 5 months on my profits have grown to more than $11,000 and I couldn’t have achieved that without all the help from bonusbank. I have been matched betting for around nine months and have made over $15,500 profit. I consider this a pretty good return given I don’t cover the horse racing or multi promos (although this is about to change). It would not have been possible to achieve this result without the tools & services (especially the ATM) here at Bonusbank. The Bonusbank team offers friendly and reliable advice which is invaluable, especially when starting out matched betting. Don’t be concerned about the price, you will find that Bonusbank will pay for itself several times over AND save you a lot of time. I would highly recommend Bonusbank and matched betting as it is easy to do if you follow all the instructions and tips through Bonusbank. You do not have to know anything about sports or racing at all, as you can follow easily once you do it a few times. Having recently come out of bankruptcy, I was looking at other ways of supplementing my income to assist in getting back on feet; and then I came across BonusBank. BonusBank has not only helped me save an extra $20,000 in the last 6 months, I have also found a new social group on the chat who are a great help in learning your way around matched betting. I am not a ‘punter’ – never have been and haven’t become one – THIS is a just a great way to make extra money with little or NO risk. Looking to make some extra cash? Look no further than Nico and the team at BonusBank. Better than being an Uber driver and its tax fee. I think matched betting is the ONLY way to win. Any experienced punter knows that betfair trading is a minefield. As for “normal” punting, forget it, it doesn’t work. Matched betting is the only option, and Bonusbank is the best available in Australia. Just want to give a shout out to the team here at bonusbank. Thanks to you, i’m completely debt free and on my way to being financially free – if things keep going the way they are. One of the most selfless bunch of people i’ve had the pleasure of being introduced to. Fantastic, dedicated and reliable service. Stacks of information and knowledge shared by both the staff and fellow punters. Has improved my betting out of site! I now smash the bookies and only worry about being banned from them. The sites calculators and software tools help a lot too. As a young university student, BonusBank has given me financial freedom and with numbers now creeping over $15,000 in just 6 short months.. I can hardly believe it myself. Truly changed my life, I’d advise everyone to give this a go – it really is some of the easiest money you’ll ever make. Hi, I joined Bonusbank about a month ago. I had only a small bank to start with and just followed what Niko and the team told me to do through the Tutorials. Now, I have tripled my original bank which is awesome. I am now ready to start implementing the “Today’s Plays”, and look forward to making even more profit. I highly recommend Bonusbank to anyone looking for a legitimate way of generating a passive income. It WORKS, and it’s easy to produce the results. Thanks again to everyone at Bonusbank for providing such an amazing service. The subscription to Bonusbank has been the wisest investment I’ve made this year. I have never been a punter. I had never bet before. But with the help of Bonusbank, I’ve made tens of thousands this year. That money has helped me move out of a toxic work relationship, strengthened my connections with friends and family and allowed me to expand my investment portfolio. The team at bonusbank is active, helpful and always friendly. They work hard to continually find value for their members. 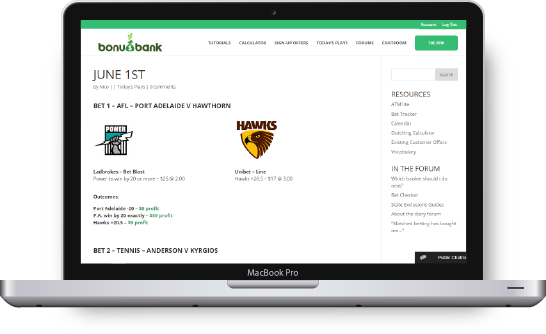 While there are other matched betting outfits in Australia, I can confidently say that Bonusbank is worth joining and that their automatcher is hands down the best I’ve seen around. Don’t hesitate; join Bonusbank today! I joined bonusbank 4 months ago and don’t regret a single $ that I spent on this membership. The tools are just crazy useful and whenever you have a question whether it’s Nico personally helping you or one of the members, someone is always there. 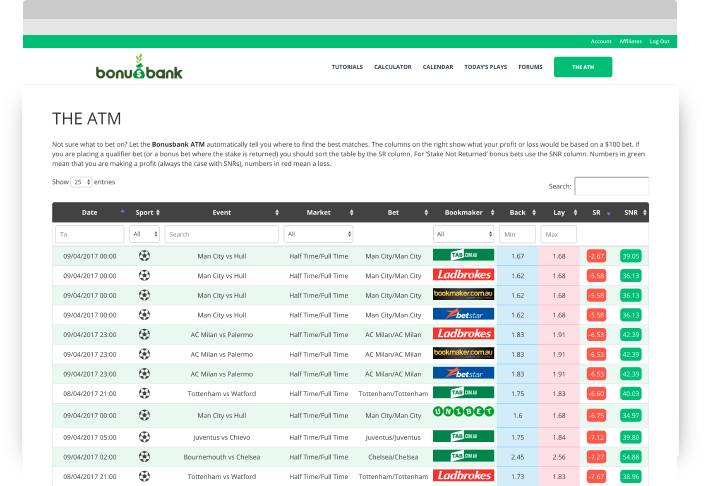 Nico and David keep improving bonusbank and always work on new features that facilitate matched betting. If you’re thinking that not joining is going to save you some bucks then you’re wrong here. Time is money and without bonusbank you’re going to spend hours looking for good matches. Look at bonusbank like a shovel when you want to dig a deep hole – yes you can do it with your bare hands but it’ll be a tedious and painful task. I usually never rate anything let alone write testimonials, however, bonusbank has given me so much that I want to return the favor. If you’re still thinking about joining, do it, it’s one of the things I guarantee you won’t ever regret for a second.